About Neoteric Cosmetics, INC. : Neoteric Cosmetics, Inc., a subsidiary of Scott’s Liquid Gold, Inc., is a 60-year-old American manufacturing and distributing company whose clear and focused intent is to offer the best, most innovative & effective, high-quality products at the most reasonable prices possible. I received some products for free in hopes I would mention them on my blog. All opinions are my own. I was not compensated or persuaded by anyone to write this review. About Batiste Dry Shampoo: Batiste dry shampoo lets you put off washing your hair for a day or even two when you are super time-deprived and washing with water is a luxury you simply can’t afford. Batiste is a quick and convenient way to get soft, clean and fresh-smelling hair. Simply spray on, massage in & brush out – no water or time required. My Review: I received the Coconut and Exotic Tropical scent and the Cool and crisp fresh scent to try out. This is my first experience with a dry shampoo. It is so easy to use and apply. You shake the can up and hold it 12 inches from your hair and spray into your roots. You can then massage it through your hair with your fingertips. Wait a couple minutes and you are ready to brush and style your hair. The dry shampoo magically makes the oil disappear and gives your hair lift. The scent stays in your hair all day. I really like it. I can’t stop smelling my hair after I apply it. The dry shampoo dries instantly and doesn’t leave any white residue. 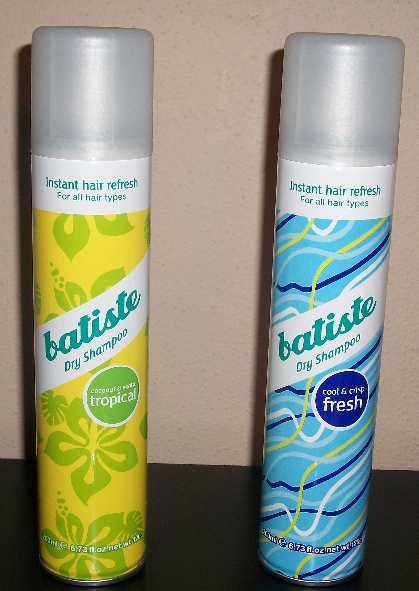 Batiste dry shampoo is great for those mornings when you’re in a hurry and don’t have time for a shower. If your hair needs a quick lift, take a couple minutes and apply some dry shampoo. My first experience with a dry shampoo was awesome and it has me hooked. They have a nice selection of scents to choose from and even carry a line for color treated hair. You can find Batiste products at Walgreens, Ulta, Kroger, Duane Reade and Bed, Bath & Beyond. You can also purchase online. You can view this video to see how easy and simple it is to use. About Montagne Jeunesse: Bursting with natural ingredients, Montagne Jeunesse offers a complete range of top-to-toe beauty treats that are good for your skin, good for the environment and great for your wallet! All are researched, developed & formulated using natural plants, essences & extracts. All are Vegetarian Society approved & cruelty-free. My Review: I’ve always enjoyed Montagne Jeunesse products. I love the variety that they offer. They make for fun mother/daughter pampering time. They sent us a nice variety to try out. They sent a warming masque, a facial peel and cream masque. These facial pouches can be found at Wal-Mart and Ulta. You can purchase these online as well. They come in individual pouches. My daughter loves the facial peels so we used that one first. We applied a generous amount of the gel to each other’s faces and let it dry for 15 minutes. It was fun watching her as she would make facial expressions as it was drying. She was so giggly. She is 10 by the way. When it was time to peel off our masques we had a little competition to see who could get the longest piece off. She won! The masque comes off super easy. We then cleaned our face with warm water to get off any excess that was left behind. Our faces were stripped of any impurities, it worked great. We couldn’t smell the cucumber much, would have liked a stronger scent. Reveal a radiant, glowing complexion. Leaves skin deep cleansed and as smooth as the softest cream. Later in the week, I tried this one out by myself late at night. I didn’t think there would be enough for two faces. There would have been. This masque is a really thick paste that you cake onto your face. I applied a generous amount, the whole package actually. I caked it on everywhere my neck, eye brows, eye lids, yep I even thought I would try it on my hair. No, not really, I was silly and didn’t pull my hair back. I left it on for 15 minutes. It dried quickly, almost instantly. When my time was up I soaked a washcloth in hot water and rinsed the masque off. It came off easily. My face was nice and clean and I could still smell the scent after rinsing. It left my face clean and soft. We have the warming masque yet to try. That will be for another week, I think our faces are plenty clean for this week. We had fun with our masques and had good experiences. We would recommend the batiste dry shampoo and the Montagne Jeunesse facial products to others. Both products would make great useful gifts. I think teenagers would appreciate both. Visit Neoteric Cosmetics online to view all the scents and products they carry and to purchase yours. You can find Neoteric Cosmetics INC. on facebook and twitter. (Batiste dry shampoo and Montagne Jeunesse Product Review) I do need to buy this product and try it out for myself sometime. Would be nice to use on the days when I just don’t have time to shampoo my hair. Thanks for the great product info! I” have to give the Batiste Dry Shampoo a try as I work long hrs and washing my hair is not an option. I want something that is natural but gives my hair a nice fresh smelling scent. Thank you for this review. I’m going to add this to my list.